The United Nation’s job is to make union between countries. After the wars, the incorporation was the main goal, to avoid more conflicts. The UN is promoting political, judiciary, social and economic development. The University was founded in 1973, but it started to work in 1975. The UN University is an international community of scientists. The center of the UNU is Shibuya-ko (Japan), but there are 3 other center in the world: Bonn, New York and Paris. In addition, there are so many institute of research and instruction. The budget of the University is separated from the UN. The University gets its upkeep from the goverment, sponsors, charities and from individuals. The center in Bonn is engaged in the protection of nature and the people’s safety. It is important for the citizens and for the governments. They think it is an admission, because the UN usually locate their centers in capital cities. The University was built in baroque style. 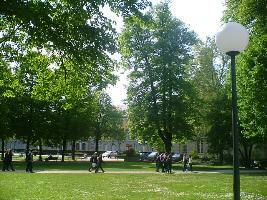 It is in the center of the city and it is not far from the basilica and the town hall. Our trip to Bonn was not long, because it is not far from Bad Marienberg. When we arrived, the weather was good, and we spent some time in the city. The park near the University of Bonn was suprising for me, because in Hungary, you can not find this kind of natural places in the middle of the city. The style of this building is influence on the whole city.